Minneapolis Drag'n Thrust, Fort Collins shame., San Francisco Polar Bears, and New York XIST make for a varied cast in this pool. Last year, upsets were nowhere to be found in Pool B in the mixed division. This year does not seem to offer many answers to how this pool will play out as only the first and last seeds have faced off. With four teams from four regions, these squads do not have much familiarity with each other. Regardless of the current form, there are some squads with championship history. Drag’N Thrust and Polar Bears actually met in 2013 club final, with Minneapolis coming out on top. From 2010 to 2015, one of those two teams found itself in the final. Both those clubs are hoping to return to such heights, while shame. and XIST look to leave their mark on the division for the first time. After three straight titles from 2013 to 2015, #1 Minneapolis Drag’N Thrust has had a few down years by those lofty standards. 2018 has seen Drag’N return to form, winning the last tournament of the regular season, taking down #3 Seattle Mixtape in the final of the Pro Championships. Expectations are high for Minneapolis, who seems more than capable of picking up a fourth national title in seven years. Minneapolis’ success is going to be tied the efforts of Player of the Year candidate Sarah Meckstroth. The dynamic cutter dominated the field during the Pro Championships. Meckstroth, Brian Schoenrock, and Caleb Denacour anchor the defensive unit for Drag’N. This trio often crosses over to aid the struggling offense. Minneapolis boasts the best defense in the division and a title run will rely heavily on its shoulders. Look for Erica Baken to be an X-factor. Drag’N faced XIST twice during the regular season, winning both matchups. The second one, at the Pro Championships, was a much closer affair, with Minneapolis hanging on for a two-point victory. Drag’N has yet to face either of the other two teams in their pool. For a team that did not earn a bid to Nationals in the regular season, #7 Fort Collins shame. enters the event looking like a team poised to upend seeding order. Fort Collins was the no. 3 seed overall at South Central Regionals before knocking off #20 Dallas Public Enemy and #8 Denver Love Tractor to win the region and steal the bid. Despite being on the outside looking in before the series, shame. is a no. 7 seed with a legitimate shot at making a deep run in this tournament. This team has a couple of big names in the mix. 2012 Callahan winner Nick Lance headlines the group. Marilyn Reich played well all regular season long. Defensively, Joe “Smash” Anderson will be in the middle of all the action. This team has a decent amount of height, which should translate to success in the deep space on both sides of the disc, including stalwarts Nick Snuszka and Jake Jusczak. While Fort Collins has yet to face any of the teams in their pool, they did upset Drag’N Thrust in pool play at Nationals last year to open the competition. shame. was just a point shy of a spot in the semifinals last season. Despite the unique path, this team should be just as competitive for a spot in the final four this year. There are just three members left from the #10 San Francisco Polar Bears team that won the national championship in 2010. Greg Marliave, Daniel Nauro and An-Chi Tsou represent the last great era of Polar Bear teams. However, there has been a massive drop off for the west coast blue blood. Following a 2015 semifinals appearance, Polar Bears missed Nationals the past two years. This year’s edition of Polar Bears is not poised to challenge in the same way it was eight years ago, but still has the talent and experience to push for a meaningful spot in the bracket. It is hard to get a good read on how San Francisco will fare against Nationals level competition. Polar Bears went 4-5 this season against the field. Six of those games also came against fellow San Francisco teams Blackbird and Mischief, against whom they went 2-4. The mixed division offered tons of excitement and upsets during the qualifying stages of Nationals. Polar Bears will hope to continue that trend by making the bracket and picking up some elimination round wins. Fleet-footed Ryan Takayama is a tough cover on their offense, while Margot Stert, Molly Munson, and Kate Schlag are all key contributors who will need to play well, but have the talent to topple higher seeds. 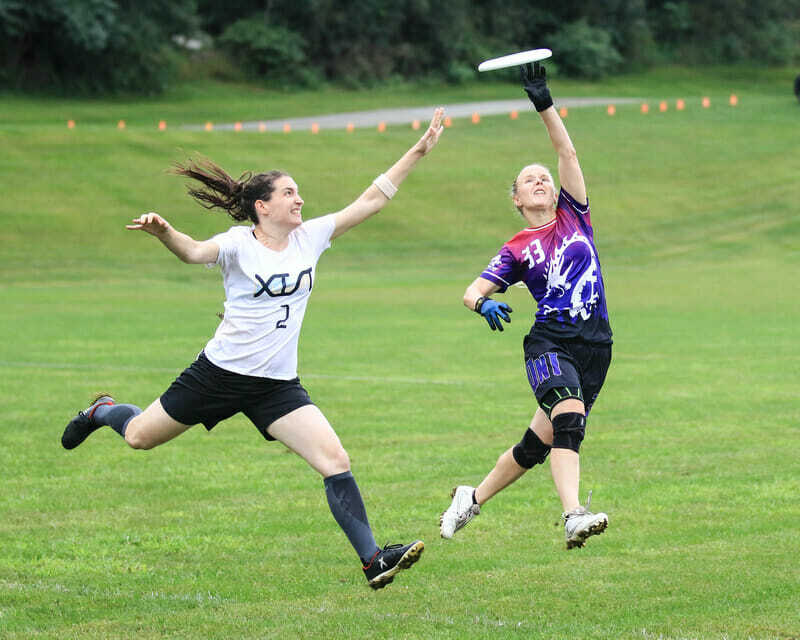 The highest ranked of the first-time qualifiers, #21 New York XIST took the second bid during a wild Northeast Mixed Regionals to close September. It was a shocking series of events over the course of regionals weekend. New York avoided having to play any of the top teams in the region outside of a pair of losses to #5 Boston Snake Country, so XIST still has a ton to prove in San Deigo. They arrive with just a single win over another attendee, a one-goal victory over No Touching! at the Pro Championships. Ryan Drost continues to look dialed in for New York. He earns blocks and scores plenty of goals. He headlines a veteran group of players with a decent amount of continuity year-to-year. Tricia Sardo and Caitlyn Hauswirth fit in as nice role players. With two losses to Drag’N Thrust, on paper, XIST seems out of their depth. However, the New York side managed a win over #12 Minneapolis No Touching! and a two-point loss to Drag’N. During its only other appearance on the Triple Crown Tour, New York lost three games to other Nationals competitors by just one point. Even if New York does not make a deep run, they will certainly keep it close. Comments on "Club Championships 2018: Pool B Preview (Mixed)"